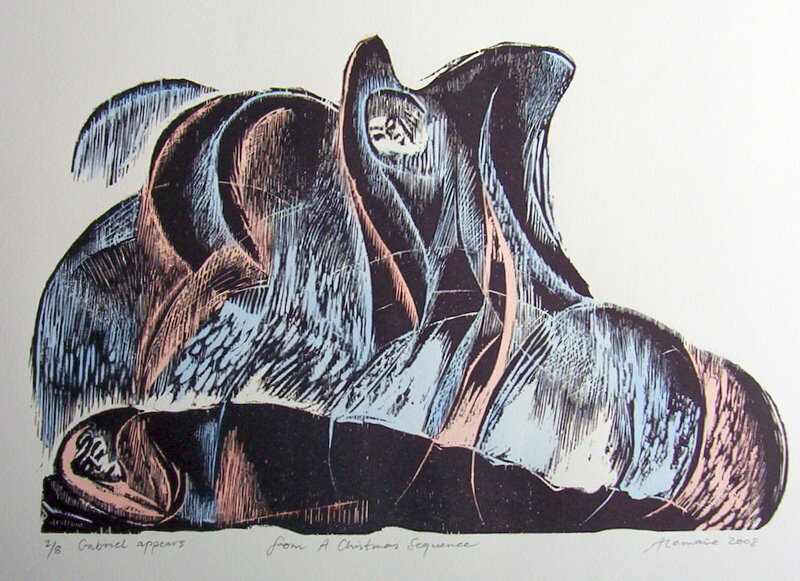 These are not 'reproductions' but images made by the artist and printed from the original plates or blocks. of them by damped paper under great pressure. Wood-engraving is made with hardwoods, usually box. sycamore to oak, etc.. The relief printer can also use found objects from which to print. The prints on these pages are ones free of specific texts and are in signed limited editions. 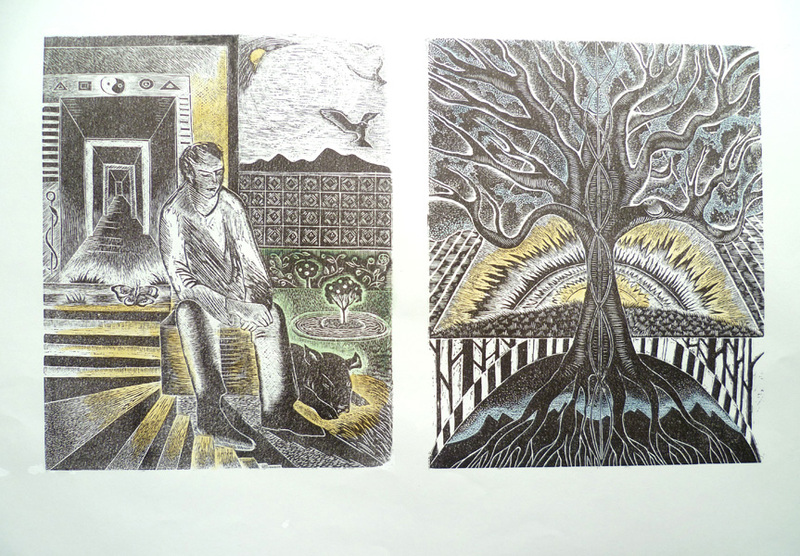 Shown here are just a few examples of more than 300+ relief prints and etchings. Further enquiries, go to ‘contact’. Christopher Skelton (1925-1992) of Skelton's Press (1968 -1985), but were never published. From JOYS, passages from the works of Thomas Traherne, The Old Stile Press, 2004.
never should be reaped, nor was ever sown. I thought it had stood from everlasting to everlasting ... "
An’ I’ll never return again. an excerpt from Kevin Crossley-Holland's translation of the poem. 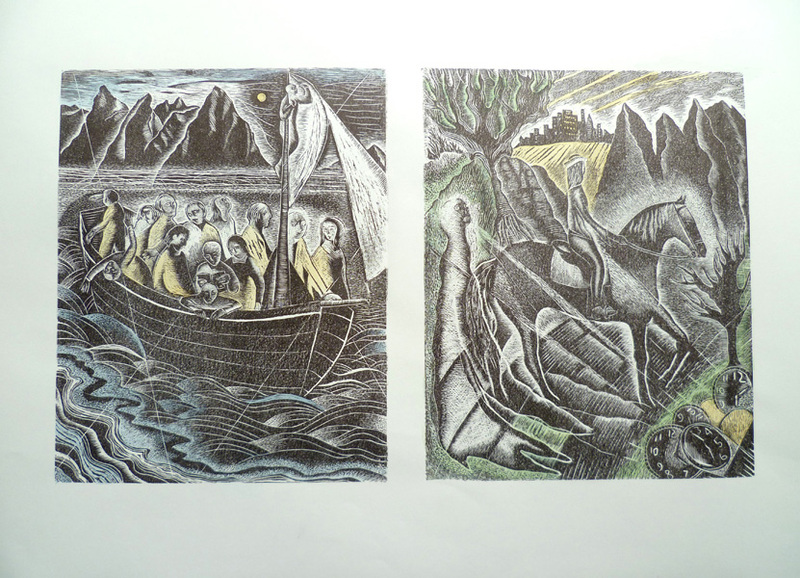 The 1st engraving, The Ship of Fools is an ancient image: a boat going nowhere. The 2nd engraving, The Rider, Death and the Ghost, is after Durer's The Knight, Death and the Devil.
" ...Though I walk through the valley of the shadow of death, I will fear no evil ..." the rider is calm, she looks ahead. The 3rd engraving is inspired by Durer's famous engraving Melancholia - he comes to himself. 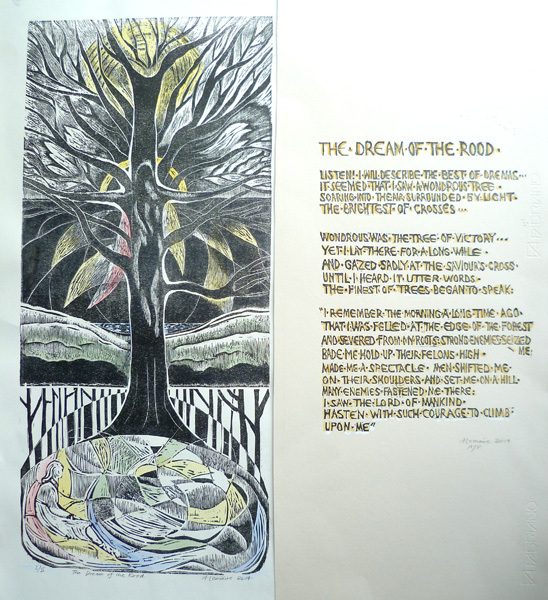 The 4th engraving is The World Tree, it is Yggdrasill, the cosmic tree. In all four engravings there are mountains in the background.